An Act of 1697, amending the Settlement laws, required that anyone receiving poor relief wear a badge on their right shoulder. The badge, in red or blue cloth, consisted of the letter "P" together with the initial letter of the parish, for example "AP" for Ampthill parish. A pejorative term for the workhouse, particularly associated with opponents of the New Poor Law, such as William Cobbett,in the 1830s-40s. As well implying an attack on the liberty of the poor, it probably reflecting the prison/fortress-like nature of some early workhouse designs. GR Wythen Baxter's 1841 book The Book of the Bastiles was a polemic against the post-1834 workhouse system. See also Grubber and Spike. The local management committee for each Poor Law Union. They were elected annually by the rate-payers in each parish in a Union. In addition, local magistrates could act as ex officio Guardians. The Board met at a fixed time either weekly or fortnightly, usually in a board-room at the workhouse. The pounding of old bones into dust for use as fertilizer. In the 1840s, there was a public scandal when it was discovered that malnourished inmates at Andover workhouse had been fighting over scraps of rotting meat left on some bones they were supposed to be crushing. Bone-crushing equipment, 1840s. © Peter Higginbotham. The Brabazon Scheme was initiated in 1880 by Lady Brabazon who later became the Countess of Meath. It was intended to provide interesting and useful occupation such as knitting, embroidery or lace-making for non-able-bodied workhouse inmates who spent long hours confined to bed or in day rooms. Training in the various crafts was provided by outside volunteers and the costs were initially borne by Lady Brabazon. The scheme was slow to take off, with Kensington being the first to adopt it in 1883. However, it gradually spread, particularly when it was found that the goods produced were saleable and made the scheme self-financing. By 1897, there were over 100 branches. Originally the graveyard adjoining the Royal Hospital in Dublin, where no payment of fees was exacted. Later used more generally as an informal term for a paupers' or famine graveyard, especially associated with workhouse burial grounds. In recent years, there has been a growing campaign to protect bully's acre sites from redevelopment. A typical 'Swing' letter. © Peter Higginbotham. The Casual Poor (usually known just as "Casuals") were those to which a workhouse gave temporary accommodation for one or two nights. Casuals — typically vagrants, tramps, or the "houseless poor" — did not need to be settled in the union. They were required to perform a task of work such as stone-breaking or oakum-picking being allowed to leave. Casuals were housed in a separate area of the workhouse, usually near the entrance, known as the casual ward. Part of a workhouse for the accommodation of the casual poor. In London and a few other large cities, casual wards were sometimes erected on separate sites. Children in a class-room - taking turns doing exercises for warmth in winter, c.1890. © Peter Higginbotham. Aston Union Cottage Homes. © Peter Higginbotham. County Home or County Institution was another name for a Public Assistance Institution. From 1869, the workhouse master had to record the religious creed of each new inmate so that appropriate arrangements could be made in respect of their education (in the case of children), serious illness, or death. The fixed (and often basic and monotonous) diet prescribed for workhouse inmates. The dietary specified the food to be served to each class of inmate (male/female, adult/children etc.) for each meal of the week, often including the exact amount to be provided. After 1834, the Poor Law Commissioners devised a set of six slightly different standard dietaries from which each union could select the one it preferred, based on the local availability of various foodstuffs. The "No. 3" diet is shown below. Diagram of an earth-closet. © Peter Higginbotham. Ex officio is a Latin phrase meaning "by virtue of one's office". Ex officio members of a union's Board of Guardians were people, usually local Justices of the Peace, who were entitled to a seat on their local Board without needing to be elected. 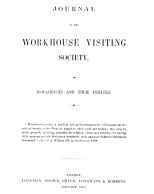 Workhouse wards for those suffering from venereal diseases. One of the slang names for the workhouse, perhaps derived from grub — a slang term for food, or from a term used to describe a person who works hard, especially in a dull, plodding way. See alsoSpike and Bastille. The name often used for the workhouse established by a Local Act Incorporations, also the "Hundred" institutions set up in Norfolk and Suffolk unions in the eighteenth century. Idiots, the most deficient, were unable to protect themselves against basic physical dangers. Imbeciles, a less severely deficient group, were unable to protect themselves against moral and mental dangers. A group of parishes joined by a special Local Act of Parliament and empowered to regulate a variety of local matters including poor relief. Originally applied to workhouse schools where industrial training was given to pauper children. After 1856, the term was more commonly applied to schools set up to detain vagrant, destitute and disorderly children who were considered in danger of becoming criminals. From the 1930s, the latter were known as Approved Schools. "Ins and Outs" were people who frequently entered and left the workhouse. Workhouses were never prisons, and inmates could leave with "reasonable notice", so long as they had been given back their own clothes — leaving the premises while wearing the workhouse uniform constituted theft of union property. "Ins and Outs" were a great irritation to workhouse staff since, upon readmission, they had to undergo all the administrative formalities required of new inmates, even though they may have only been absent for a few hours. For an example, see the episode involving Charlie Chaplin's family at the Lambeth workhouse. "The Itch", or scabies, was a common medical condition caused by a small parasite, similar to lice, which burrows under the skin casuing severe itching. The conditiuon was often contracted through occupying a bed with an infected individual. Most workhouses had specially designated "itch wards" for such cases. The principle that conditions in the workhouse should never be better than those of "an independent labourer of the lowest class." A special Act of Parliament granting a group or incorporation of parishes the powers to regulate local matters such as poor relief, lighting, watching etc. an amount such as fivepence was written as 5d. (the "d" originally stood for denarius — a small Roman coin); two shillings and nine-and-a-half pence was usually written as 2s.9½d. or 2/9½ — and read as "two and ninepence ha'penny"
Coins in use included: the farthing (¼d), the half-penny or ha'penny, the penny, the threepenny bit, the sixpence, the shilling, the florin (2/-), the half-crown (2/6), the crown (5/-), and the sovereign (£1). Loose fibres obtained by unpicking old ropes which were then sold to the navy or other ship-builders - it was mixed with tar and used for caulking (sealing the lining) of wooden ships. Picking oakum was done without tools of any sort and was very hard on the fingers. Picking oakum in the East End of London, 1906. © PRO (PRO 30/69/1663). A provision whereby out-relief could be given to able-bodied applicants, in return for their performing manual labour such as stone-breaking. No more than half the relief could be given as money. Out-relief unions originated in 1873 as a result of a proposal by Local Government Inspector Andrew Doyle. He suggested that where parts of a union fell in different counties, the creation of an out-relief union within each county area could simplify the administration of out-relief and also allow different counties to adopt differing out-relief policies if they wished. The existing poor law union would still operate the workhouse for indoor relief across the whole union. Formal provision for out-relief unions came in section 58 of the 1888 Local Government Act and section 36(b) of the 1894 Local Government Act. Out-relief unions were formed on 28th December 1894 at Malton and Norton (bopth members of the Malton poor law union); Belvoir and Grantham (Grantham union); Bishopthorpe, Escrick, Flaxton and York (York union); and on 31st March 1895 at Keynsham and Warmley (Keynsham union). Officials of a parish, between two and four in number, appointed by the Vestry. The duties of this unpaid post, first established in 1572, were primarily financial - to supervise the collection and distribution of the poor rate. The official name for a workhouse after 1912. A compulsory local tax, dating from 1597, based on an official assessment of the value of the property in which one lived. It was collected by Parish Overseers and distributed under the jurisdiction of the Vestry. After the formal abolition of the workhouse system in 1930, many former workhouses were redesignated as Public Assistance Institutions (PAIs). These establishments were administered by local Public Assistance Committees set up by county or county borough councils and were sometimes known as County Institutions or County Homes. PAIs provided accommodation for the elderly, chronic sick, single unmarried mothers and, in many cases, vagrants. The Institutions inherited many staff and inmates from the workhouse era and were not that different from their predecessors except that there were no uniforms, and the residents (rather than "inmates") could come and go as they pleased. Rebecca rioters, 1843. © Peter Higginbotham. The process by which a person was returned to their parish of settlement from another parish where they had become a charge on the poor rates. The principle by which a person could only claim poor relief from the parish under which they were officially "settled". Anyone trying to claim relief without correct settlement qualifications could undergo forcible removal to their own parish. A child's settlement at birth was taken to be the same as that of its father. Illegitimate children were granted settlement in the place they were born. If a boy became apprenticed his parish of settlement became the place of his apprenticeship. At marriage, a woman took on the same settlement as her husband. Settlement could also be acquired by various means such as renting a property above a certain value, or being continuously employed employed in a job for a year and a day. A thin oatmeal soup or gruel - a regular part of the workhouse diet. When the gallon loaf of second flour weighing 8lb. 11oz. shall cost 1s., then every poor and industrious man shall have for his own support 3s. weekly, either produced by his own or his family's labour or an allowance from the poor rates, and for the support of his wife and every other of his family 1s. 6d. When the gallon loaf shall cost 1s.4d., then every poor and industrious man shall 3s. weekly for his own, and 1s.10d. for the support of every other of his family. And so in proportion as the price of bread rises or falls (that is to say) 3d. to the man and 1d. to every other of the family on every penny which the loaf rises above a shilling. Thus, if the price of bread rose to 1s.3d., a married man with two children would be guaranteed a wage of 3s.9d for himself plus three times 1s.9d., giving a total of 9 shillings a week. A short metal nail used in picking oakum. A large metal spike fixed in the ground or a rock and used for stone breaking. Spikes fixed to the top of the vagrants' yard wall to deter escape attempts. The pointed lightning conductors which adorned the roofs of workhouse buildings. Spike Island, near Cork, where convict gangs used to work. The men subsequently experienced similar treatment in workhouses and so began to refer to them as 'spikes'. The reference in Pickwick Papers (towards end of chapter XLI) to the Fleet Prison as 'Spike Park', a term said to have then been in common use among the inmates of the institution. A derivation of "spiniken", another tramps' name for a workhouse, originally based on "spinning house". See also Bastille and Grubber. Spikes in vagrants' yard wall at Ripon workhouse, 2000. © Peter Higginbotham. Roof "spikes" at Bolton workhouse © Peter Higginbotham. The entrance to Dunmow features a large iron (ornamental?) "spike". Another workhouse "spike"? © Peter Higginbotham. A task sometimes performed by workhouse inmates, although most often used as a task for casuals or an outdoor labour test. Large blocks of stone had to be broken to pieces small enough to fit through a metal grid. The broken stones could then be sold for road-making. Stone-breaking cell interior, c.1909. © Peter Higginbotham. A slang name for bread, often of poor quality. A large wooden wheel or drum with steps on its outside, generally used in prisons rather than workhouses. It rotated as inmates trod from one step to another - rather like the wheel in a hamster cage. A grouping of adjacent parishes jointly administering poor law affairs. The "union" was one of the slang names for the workhouse. The governing body of a parish. Its name derived from the room in a church building in which it usually met, which in turn came from its function as a room where the priest put on his vestments. Its membership comprised a chairman (the minister of the parish), the churchwardens, and a number of respected householders of the parish. The official name for a casual ward after 1930. A certificate issued by a casual ward or police-station to casuals judged to be the "honest unemployed" giving them preferential admission or treatment at a workhouse casual ward. The principle by which a pauper would only be granted poor relief through being admitted to a workhouse and being prepared to accept the terms of its harsh regime. Specially minted coins issued as poor relief. A number of these were minted by various organisations in the early 1800s when there was a national shortage of coins caused by scarcity of copper and silver. Tokens were produced in a number of denominations, the most common being 1d., 3d, and one shilling. The tokens could be spent locally and the trader who received them could redeem them at the workhouse. In 1817, such tokens were declared illegal although a temporary exception was made for those for the Birmingham and Sheffield workhouses. The first example below, from 1812, features a picture of the Birmingham workhouse, and the wording "ONE POUND NOTE PAYABLE AT THE WORKHOUSE FOR 240 TOKENS"
Birmingham workhouse token. © Peter Higginbotham. Another example, also from 1812, was manufactured in Birmingham for use by the Bradford workhouse. Bradford workhouse token. © Peter Higginbotham. Here is an 1813 penny token minted for the Halesowen Workhouse. Halesowen workhouse token. © Peter Higginbotham. Finally, here is silver shilling token issued by the Leeds workhouse in 1812. Leeds silver shilling workhouse token. © Peter Higginbotham. Tokens were also issued during the same period at Tunstead & Happing in Norfolk, and at Worcester. In the late 1800s, the Social Wing of the Salvation Army made use of tokens, for example for paying men working at its "Elevator" factories. Salvation Army 4d Token. © Peter Higginbotham. Organization founded in 1858 by Louisa Twining. Its aims were "the promotion of the moral and spiritual improvement of Workhouse inmates" - especially "destitute and orphan children", "the sick and afflicted" and "the ignorant and depraved". The Society published a Journal from January 1859 until 1865.